Online platforms have disrupted the music business. Users of streaming services such as Spotify enjoy the comfort and vast music selection, and streaming revenue has increased. At the same time, many musicians complain that they do not get a fair revenue share and some platforms struggle to be profitable. Is there need for regulation or will the problem fix itself? When platforms have the potential to connect music acts directly with music listeners, will they soon become a serious competitor for major labels and their distribution? What will the future of music content providers look like? To address content uploaded by users and potential copyright infringement on open platforms such as SoundCloud or YouTube, the European Commission has launched legislative efforts in 2016 that are still ongoing. The controversial proposal seeks to make platforms liable for user uploads and obligate them to either filter or license the content. The hope is that this will lead to a fair remuneration for musicians – but will this goal be met? Many scholars and civil liberties organisations have criticized the potential collateral damage of filtering obligations that may lead to overblocking of legal content and less cultural diversity online. Others have proposed permitted-but-paid regimes for non-commercial user generated content. Is there a way to balance the interests of all parties involved? Finally, the rise of platforms in the music business could have implications for our understanding of copyright regulation more generally. What problems arise when platforms or their algorithms decide copyright disputes? How have power relations changed? Is it necessary to adjust the focus from questions of copying to access regulation? What could fair conditions look like and do users have sufficient access to diverse cultural goods? 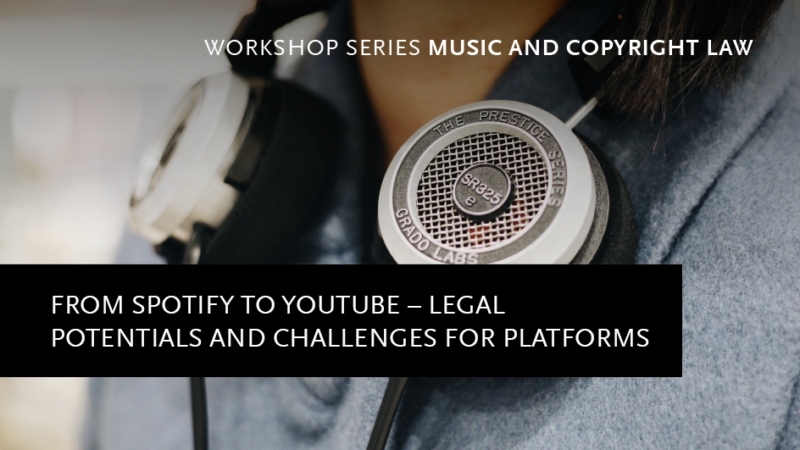 In 2017 and 2018, the Alexander von Humboldt Institute for Internet and Society (HIIG) organises a workshop series in cooperation with the Haus der Kulturen der Welt (HKW) to discuss the most urgent issues around music and copyright law in the digital society. Please note that the workshops are not open for public and address experts in the field of music and law. Registration to the event is unfortunately no longer possible.